In this article you will learn the basic rules of writing and formatting texts. Properly composed text ensures an increase in the number of times it is read. If your text functions as advertising, then the more interesting your text is, the more your revenues grow. That's why you should pay close attention to text formatting! How do we read a text? Before we talk about the rules of text formatting we should mention how we read a text. As a rule, reading an unfamiliar text occurs in three stages: first, a person just takes a glance at the text and decides whether to read on or not. This takes up to three seconds. During this time, the reader analyzes the complexity and develops a perception of the text. The meaning is not yet in question. The human eye takes 2 seconds to scan a sheet of A4 and is able to identify and analyze up to ten elements – the so-called hooks. Hooks can be paragraphs, photos, or titles. Each of them is able to attract attention and keep it. If a person decides that reading the text will be easy, then he proceeds to the second stage – scanning the text and grabbing different pieces – fragments of sentences. Such "reading" can begin from anywhere in the text. Only then, if the pieces are of interest to the reader, will they start from the beginning. In this regard, we suggest you to learn the basic rules of text formatting, which will make it simple, understandable and readable. The title should be sufficiently large and contrasting. To contrast the title, you can use either a bolder typeface of the main font or another font, as long as it is in harmony with the main one. In addition, the title can be highlighted with a color - a shade of the main color or an additional color used in the design. The optimal size of a paragraph should be 4-5 sentences. Short and narrow paragraphs are better absorbed. Comfortable width of a paragraph of 40-50% of the page width. This rule is more applicable to web pages, but you can also use it for printed text. Separate every 2-3 paragraph by subtitles. This way you structure the text. Break it down into semantic parts, further simplifying reading. We offer you a few tips which will make your text simple, clear and easy to perceive. Alignment of text in the center or the width is considered to be an extremely bad choice. By aligning in the width, we get uneven spaces and indents between the letters. In some places they are narrow and in some they are wide. By aligning the text in the center, we get an uneven left and right edge. This text is even more difficult to read, because each new line starts with a new location. There is an alignment to the right. In our opinion, it has the right to exist, but only when dictated by the need of your design. The ideal solution is to align the text to the left. The right edge, at the same time, should be made as smooth as possible by moving all the prepositions and words less than three characters onto a new line. Reading such paragraphs is quite comfortable, and visually they fit into 99% of designs. It is much more pleasant to read when there is a place between the lines. As a rule, try to use the interlining, at least 2 points more than the font size. For example: for maximum text readability with a font size of 10 pt, you need to set the interline of at least 12 pt. Between the paragraphs should be 1.5 line spacing. The line spacing is maintained relative to the font size and measured in percentages. 1) Underline. The standard and the most popular way, always perceived as a link, especially if allocated in a blue color. In order to make underlining look organic in any design, you can make it translucent. We would not recommend using underline as a technique for highlighting a word or text. Underlining is always used for links. 2) Changing the font style of a link to bold. A less desirable way, as the use of different styles will make it difficult to perceive the text. Fonts are as important for design as correctly chosen colors or convincing texts. The fonts are divided into three main groups: serif, sans serif, and handwritten. Fonts belonging to this group have tick marks or "tails"on the edges of the letters. These fonts include Times new Roman, Century, Times, Garamond and some others (marked as Serif). Typically, serif fonts are better suited to printed materials. Serifs help to create space between letters, as well as to separate one character from another, so that the text is better read on paper. Serif fonts emphasize authority, intelligence and professionalism. These type of fonts have no serifs and edges of letters are straight and simple without any additional elements. Examples-Arial, Verdana, Helvetica and others (sans-Serif). They are usually used for web pages because it is more convenient to read round and simple letters from the computer screen. Sans serif fonts tend to emphasize style, rationality, youth and modernity. As the name implies, they imitate handwritten text. Such fonts can be very nice and can decorate your document, but they are very difficult to read. Therefore, we do not recommend using handwritten fonts for the decoration of long texts. They are more suitable for the design of headlines and creating logos. In order for the text to read well, the font size of the main text should be 12 or 14 px. It is not advised to use fonts less than 10 px. For the title, the default font size is between 16 and 24 px. The ideal line spacing is 1.5. No matter what color the font is, it should be contrasting i.e. easy to read. The best combination is a dark font on a light background. The reverse option is a light font on a dark background, which is less preferable, but can look good on small texts, titles, and others with large font sizes. Bright fonts can be difficult to read. Also, avoid complex vibrating combinations such as red on green. The best option is black (dark gray) font on a white background. In one design you need to use one, or a maximum of two types of font. 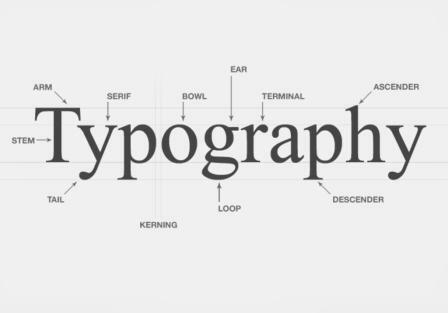 If you use 2 types of font, they should compliment each other. In this case, one font is used for the main text, whilst the other is used for titles or to represent information that you want to highlight, for example, contacts. If you think that two fonts are not enough, try experimenting with bold and normal text, italic, uppercase and lowercase letters. It is obvious that a font should be chosen for a specific task. For example, if you're developing apps, you'll favour slightly futuristic fonts. Whereas, if you sell old books, we we recommend choosing something vintage and old-fashioned. In any case, it is better to use simple, easy-to-read fonts for the main text, since the design is not only beauty. First and foremost it is about functionality and convenience. We recommend using short sentences in the text, if possible, for easy assimilation of the information. Therefore, sentences with enumerations divided with dots. Simplify the complex figures. Eyes should glide over the text. Don't use two verbs in a row. Replace them with simple verbs in an imperative form. For example, not "Helps to solve", but "Solves"! Not "Ready to offer", but "Offer", etc. The "not" particle changes the appearance of the sentence and makes it difficult to perceive. All negative wording should be changed to positive. For example, instead of "Not Difficult" it is better to write "Simple", instead of "Do not use long sentences" it is better - "Use short sentences", etc. Abbreviations and acronyms make the perception of the text much more difficult. Instead of sliding through the text, the reader constantly stumbles. A person should not puzzle over trying to figure out what you wanted to tell them. Even common abbreviations should not be used. Foreign words, as well as abbreviations, prevent the correct perception of the text. Terms are needed and important if you are writing for professionals. However, if you writing for a mass audience, it is better not to risk causing confusion and replace these terms with more familiar concepts. All formulations are positive, without the particle "NOT".